Tonight, I am watching Andy Murray v/s Somebody Wawrinka at Wimbledon. By which I mean they’re at Wimbledon, not me: I’m at home, they’re on TV. For reasons that I don’t understand, they’ve got the roof closed at Wimbledon even though it’s a clear sky out there. Apparently there was a light drizzle earlier on and they panicked and now they’ve forgotten where the switch is to reopen it. I think Andy may be winning but the score keeps changing and I really don’t understand. The BBC have got some geezer called McEnroe who keeps yattering away with obscure comments that are supposed to help us understand, but which leave me mystified: “You need a sure ball but Wawrinka’s gonna still punish it.” What does that mean? but by the time I hit publish it will change again. Never mind: one of ’em’s gonna win and the ref keeps calling them ‘love’ and they are both hunky chaps so I can see why. I guess he’s thirsty now coz he’s just asked for some juice. Posted by Phil Groom in Bookshop Ramblings. Sometimes in life we need rules. Maybe all the time: as bourach reminded me recently, the rules are what make things safe; without them we face chaos. Here’s my proposed rule for reading when you’re faced with too many books and you don’t know where to start: do you start with the old ones or the new ones? My rule is: Read the new ones first. Why? Because the old ones will always get older; the new ones will never get newer. If you read the new ones whilst they’re still new, then you can turn to the old ones later. Do it the other way round, though, and you’ll only ever have old books to read. Books: probably the only thing in life I’m qualified to make a rule about! Posted by Phil Groom in Theological Reflection. It’s because there’s more than one of me. It’s complicated. Just listen for a moment, OK? — as I was saying before we were so rudely interrupted, in my last post we finished by taking the lid off the teapot, and it was empty. For me personally this presents something of an existential crisis: I’m a coffee drinker. But let’s imagine, for a moment, that we’re tea drinkers. What do tea drinkers do when they encounter an empty teapot? 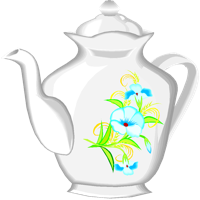 I was brought up in a family of tea drinkers: life revolved around the teapot. Notice that: the teapot never revolved around us — the teapot was always at the centre, always there, always within reach, at the heart of our daily devotions. There might even have been times when the teapot was in control: when it was empty, we’d put the kettle on; and if the kettle was empty, we’d fill it from the tap. The teapot never demanded our attention, but always received it; and it never, ever, as far as I remember, went into orbit. But what happens when the tap runs dry? If you’re like my Dad, you get out your kit box and start crawling around the pipework until you’ve fixed it; and if you can’t fix it, you call a plumber. I suppose another alternative would be to declare all tea drinkers insane, throw a hissy fit Dickie Dorkins style and smash the teapot; but I’m not convinced that’s going to help the tea party run any more smoothly. Far better, if you can’t find a plumber, to take a trip down to the river and fill the kettle there. But what if the river’s run dry? Down to the sea, I guess. Trouble is, us humans can’t drink from the sea. Put that stuff in your kettle and you’ve got problems: seawater and human life simply aren’t compatible. And as you look out towards the horizon where the sea kisses the sky you realise: this is it. This is where the water comes from and returns to, endlessly cycling, no beginning, no end… and you, you and I, we’re a part of that deep, a part of that mystery: that same water flows in our veins, pumps through our hearts, powers our souls, our lives, our very being. Today, I am in a whimsical frame of mind. Inner woman and outer man have settled their differences and are no longer fighting one another: instead, we are amused. We are amused by the atheists getting uppity over our review of Geoffrey Berg’s Six Ways of Atheism — twice over, in fact, as we are quoted at length by The Freethinker in Barmy Baptist resorts to sarcasm in dismissing new atheist book. It’s all highly entertaining. What has me puzzled (there’s only one of me really, despite the voices in my head), though, is why the current crop of atheists are getting themselves so wound up over something that they say doesn’t exist. I’m not about to argue the toss on that one, though: as I’ve said before, God doesn’t exist: get over it. I can understand Christians getting enthusiastic, especially when they’re new to the faith: I remember my own teenage years, out there with the best of them (or the worst, depending on your point of view), making like your friendly neighbourhood preacher, on fire for Jesus because I thought Jesus was the answer to the world’s woes. As it happens, I still believe that, but I’m no longer interested in converting people to my point of view: winning new disciples is Jesus’ job, not mine — my job is to be a disciple. … for far too many Christians, belief in God seems to lead only to an attempt to make other people believe in God—so that they can make other people believe in God. Dawkins is right: the God Christianity all too often offers the world is nothing more than a giant teapot in orbit around the earth. Me, I took the lid off the teapot and it was empty. Posted by Phil Groom in Poetry. I am coming back for you. Posted by Phil Groom in Life Issues. Twitter. You know it makes sense. I know it makes sense. To me, it makes sense because it connects: it takes me to places and links me to people that I didn’t know existed. @bourach and @serial_insomnia who blog, respectively, at conversationswithmyhead.blogspot.com and serialinsomniac.wordpress.com. Both of them struggle with mental health issues or insanity or whatever it is you want to call it. Personally, I call it being human; and both of them are courageous enough to blog about what’s going on in their heads, about their battles with madness and the difficulties they face. I find that their honesty and openness in describing and discussing their lives and thought processes puts me to shame as I hide behind my mask of normality. Me, normal? Geometrically, maybe: at right angles to the rest of the universe. Perhaps one day I will have the courage to tell the world what’s going on in my head. Who decides what’s normal anyway? @bourach and @serial_insomnia: I salute you. Posted by Phil Groom in Church. Christianity is a contact sport. If you belong to the Church of England you know that: the moment the priest announces the Peace, the pews explode as the people descend upon one another with whoops of enthusiasm — and deliver wet fish handshakes that make you feel like it’s a visit to the fishmonger’s rather than an encounter with a fellow pilgrim or a soulmate. Don’t know about you but there are times when I need a hug, not a handshake. I need to know that the person I’m with is with me, not simply standing there in another private space. I need to know that we inhabit the same world under the same sky and share at least some of the same concerns. I need to connect, physically. But that’s not allowed, is it? It’s not proper. It’s… too tactile. Too touchy-feely. Dangerous. Sensual. Ooh, now we’re approaching the nub of it. Can’t have Christians being sensual: it might turn sexual; and Christians don’t do sexual, do they? They do, actually. It’s where the little Christians who mummy and daddy Christian bring to church with them come from. But that’s not the problem, is it? The problem is fear. The same problem I highlighted in my last post about the BNP. Fear. Fear that the amazing, beautiful gift of physical contact that God has given us might . just . signal . something . else . It’s a real fear, I’m not denying that. For those who’ve been abused by people who should have been trustworthy, by church leaders who’ve betrayed their calling, it’s a nightmare. But the greater reality is that such betrayals are not the norm. Let me say that again: abuse and betrayal are not the norm. Abuse is an aberration. As followers of Jesus, we need to recognise that. We need to show that a better way is possible. We need to start from a position of trust. I’m not saying that’s easy. We live in a world of fear, where we’re constantly looking over our shoulders because the person behind us might be up to no good. This is God’s answer to the fear of physicality: incarnation followed by resurrection. No disembodied souls for our God but grounded, glorious down-to-earth physicality. We say: Do not touch! Do not walk on the grass! Do not pass go! Jesus says: Get out of jail free! Jesus frees us but we dare not be free. Jesus breaks down the walls but we demand barriers and safety nets. And yes, sadly, we do need them. But first, we need trust. We need faith. We need hope. We need love: and perfect love drives out all fear. Perfect love leaves room for touch, cries out for contact. Try it sometime. Break free from the wet fish handshakes and give your neighbour a hug. Posted by Phil Groom in Current Affairs, Life Issues. Many things in life simply ought not to be. Some we can change, some we can’t. Consider the dodo: wiped out by human greed, hunted to extinction. Gone for ever because we, as what has become the world’s dominant species, placed our own interests above everything else, because the island upon which these birds once lived simply wasn’t big enough for them and us. All we can do today is look back in shame; and if we dare to dream, hope somehow for a Jurassic Park style breakthrough in science to bring them back from a preserved fragment of their DNA. Consider the BNP: driven not so much by human greed, I suspect, as by fear. Fear that somehow we, the British, are like the dodo, too tame or perhaps too stupid to resist the foreigners who have landed upon our shores. Fear that this island simply isn’t big enough for them and us. Fear of change, fear of difference, fear fed by folly and ignorance. Fear. I do not claim that this is an easy way: who amongst us lives in perfect love? Who has never been afraid? The band went to Arizona anyway. Bono faced the fear, closed his eyes, and sang; and when he looked up, Adam had moved from his usual stage left position to stand in front of Bono as a human shield. Thankfully the shot never came: both Bono and Adam lived to tell the tale and continue playing and singing. But here was love conquering fear. Here was love driving out fear, exemplified, ironically, by the one band member who would not identify himself with Christianity. This, I think, is where we who are followers of Jesus in the UK are called to stand in relation to the BNP and our immigrant population. The BNP seek to destroy and drive out. Our immigrant population seek to live amongst us. We must be their shield: we must show the way of love by standing between them and the BNP’s message of bigotry and hate. The Archbishops of Canterbury and York were right to issue last month’s call for voters to boycott the BNP. The danger to British society lies not in increasing multiculturalism but in isolationism. Hospitality and welcome to strangers, surely, lie at the heart of British identity — but more importantly for those who would claim to be following Jesus, these things lie at the heart of our Christian identity. The way forward for Britain lies not in a renewed expansionism — the days of Britain’s dominant position in the world are over and done; but nor does it lie in a new reductionism, shrinking in upon ourselves, raising the drawbridge to hide in our castles, rejecting the rainbow mix of colours and influences that have made us what we are. No: the way forward for Britain — if Britain wants to rescue the word ‘Great’ now so meaninglessly tacked onto the front of its name — is the way of love. We must learn to serve — and what could be a better way for a country known as a nation of shopkeepers? Meera Syal looks at the issue of self harm in the UK. It’s a difficult and distressing subject, but one that Meera has studied closely over the years and which is close to her heart. In this moving journey Meera she will seek to answer: what is self harm, who does it affect and why? Meera meets people who have experienced self harm, including those that have now recovered and others who are still suffering. She also learns about the complicated issues that can lead to a person taking such drastic action.